Boiler Installation St Louis - Call For Your Replacement Today! Hoffmann Brothers heating and cooling contractors are one of the most experienced boiler companies in the St Louis and Metro East areas. Our boiler service technicians have extensive training and are certified to install any brand in your home. There are many options when it comes to choosing a new boiler installation or a boiler replacement of an old one. Hoffmann Brothers has a selection of hot water, steam and high efficiency boilers. Are you asking, “Where can I get boiler installation near me?” Contact one of our Project Managers at (314) 664-3011 or request a bid online to schedule a free estimate for a boiler installation with our St Louis HVAC headquarters. Get Your Boiler Replacement Today! 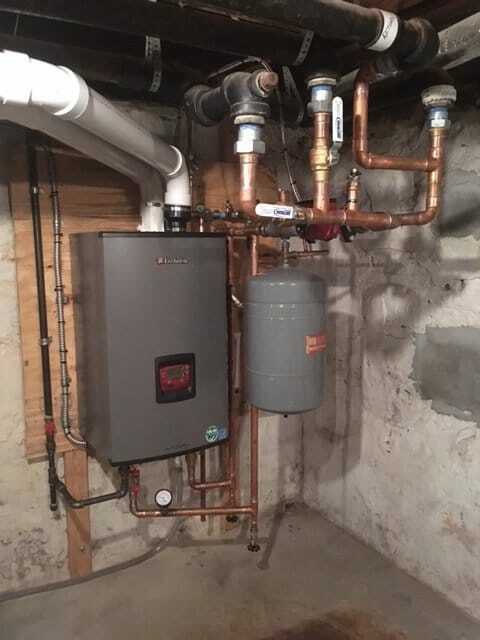 When homeowners are faced with the replacement of a boiler system or boiler installation, there’s a tendency to overlook critical features, which can alleviate future heating system repairs and headaches. Cheaper, less energy efficient boilers are often high maintenance and riddled with malfunctions. Lochinvar, Buderus, Burnham, Peerless, Weil McLain, Carrier, Dunkirk, GE/Rheem, American Bryant, Noritz, Grant Boilers and many more. Energy savings and conservation. Consider a boiler system, generating British thermal unit inputs of 150,000 to 300,000 an hour, coalesced with minimum annual fuel utilization efficiency (AFUE) rating of at least 84 percent. This represents an 84 cent savings per dollar, consumed to warm the home. Two stage firing contributes to a boiler’s energy savings and conservation, as well, matching the output of heat to the demands of the system. Safety. An electronic ignition assures safety by alleviating the perpetual need of a burning pilot light. This boiler system feature also promotes reliability, without any frustrating flame failures. Sealed combustion chambers extract outside air, obstructing any build up of fossil fuels and air pressure. This happens to be another hazard free feature that complements energy savings. Dependability. Opt for an energy efficient boiler and hire a licensed HVAC contractor to ensure for an expert foolproof boiler installation. If you are interested in installing a new boiler in your St Louis home, call Hoffmann Brothers heating and cooling at (314) 664-3011 or request a bid online.